It is easy to assemble a canvas for a future masterpiece! 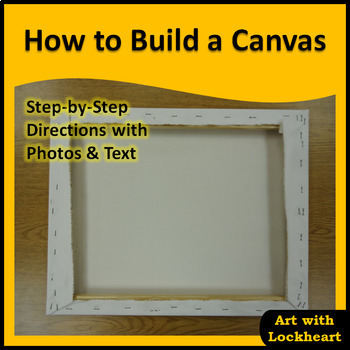 Use the “How to Build a Canvas” PowerPoint tutorial to teach students how to stretch canvas on a wooden frame successfully. This complete demonstration contains 28 slides that include photographs and descriptive text to illustrate how to prepare a canvas. The steps begin at cutting the fabric, include details on where to place staples, and there are steps on how to get perfect canvas corners. This tutorial is vital for painting teachers! 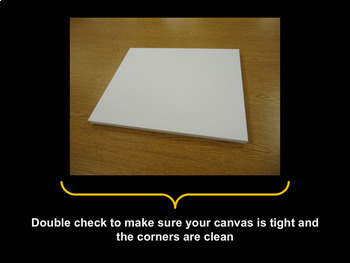 The illustrative “How to Build a Canvas” tutorial is perfect for saving busy art teachers valuable preparation time. It also cuts down on demonstration time, allowing students to spend more class working instead of waiting. The PowerPoint is fantastic because the art instructor can demonstrate to the entire class and assure that all students can see the steps clearly. Students enjoy making their own canvases before they paint because it helps them feel like real artists. 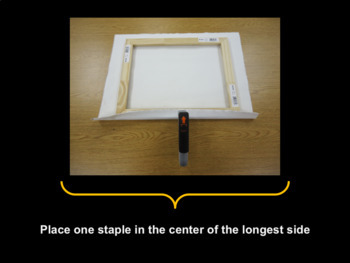 The tools used in this demonstration include: pre-made wood stretcher bars, a mallet (hammer), canvas, scissors, a staple gun, staples, and canvas pliers. The demonstration uses pre-gessoed canvas, but regular canvas is stretched the same way. Safety glasses were worn during the construction as well. Use this demonstration before teaching students how to paint a Fauvist Painting or before they create anImpressionist Style Acrylic Painting.